Political parties in Asia should reinforce cooperation to maintain peace, security, prosperity and development in the region and the world as well, said Hoang Binh Quan, Chairman of the Communist Party of Vietnam (CPV) Central Committee’s Commission for External Relations. 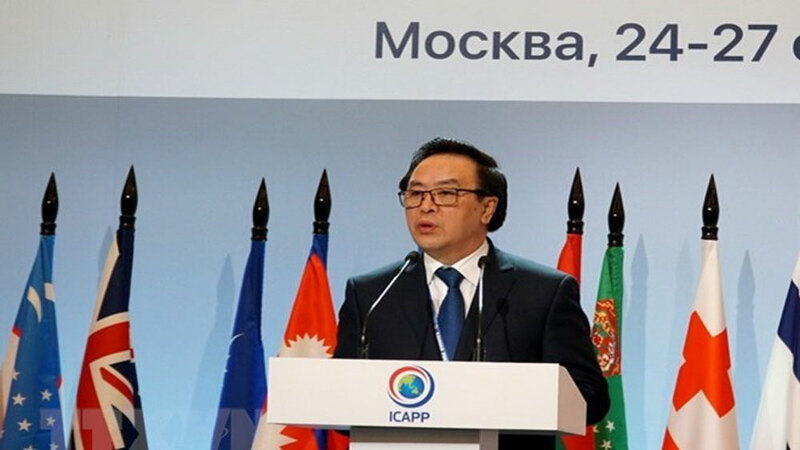 Quan was speaking at the first plenum of the 10th General Assembly of the International Conference of Asian Political Parties (ICAPP) that opened in Moscow, Russia, on October 25. Hoang Binh Quan, Chairman of the Communist Party of Vietnam (CPV) Central Committee’s Commission for External Relations, speaks at the first plenum of the 10th General Assembly of the International Conference of Asian Political Parties (ICAPP). He called on Asian political parties to heighten the spirit of dialogue and cooperation, build trust and settle disputes and conflicts through peaceful measures based on fundamental principles of the UN Charter and standards of international relations. At this year’s general assembly, the CPV was elected as Vice President of the ICAPP Standing Committee. The two-day event brought together about 500 delegates, including representatives of more than 70 political parties from 40 countries and observers. The delegates focused on the role of political parties in ensuring international security and fighting extremism, as well as building and developing mutually beneficial political, socio-economic ties between countries. Earlier, the CPV delegation paid a courtesy visit to Boris Gryzlov, Chairman of the United Russia Party Supreme Council, and held talks with Evgeny Revenko, Deputy Secretary of the General Council of the United Russia Party. The two sides committed to making all-out efforts to effectively implement the outcomes of the visit to Russia by General Secretary of the CPV Central Committee Nguyen Phu Trong last September. They agreed to coordinate with relevant agencies of the two countries to prepare for upcoming visits to Vietnam by Russia’s senior leaders. At the same time, they will work to fruitfully realize cooperation agreements reached by the two parties, especially in intensifying political consultations and dialogues in order to continuously promote mutual trust and understanding, contributing to creating a firm political foundation and forging the Vietnam-Russia comprehensive strategic partnership. The third ASEAN Ministerial Meeting on Women (AMMW) and related meetings will take place in Hanoi on October 18-25, Deputy Minister of Labour, Invalids, and Social Affairs Nguyen Thi Ha told a press conference on October 15. Vietnam is likely to remain the fastest-growing ASEAN economy in 2018 and 2019, as in 2017, stated a new report released by Standard Chartered.